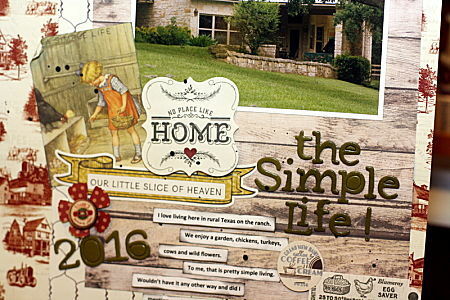 crafty goodies: the simple life with Authentique! of two of our grands and they are always fun, that is (when they don't fight )!! Love being with them !!!! I really struggled with this page. I loved the paper but had a hard time making it work. I settled for this design and was happy with it. The papers are gorgeous and very vintage looking. 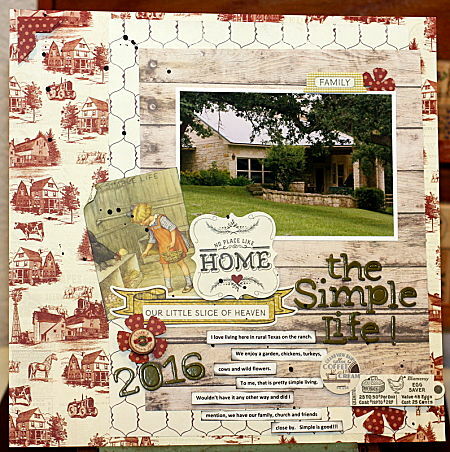 I layered several of them, to showcase the patterns, in the Homestead Collection. The die cut cards are adorable and enhanced the page. I love to speckle the page using Tumble Dye/Black by S.e.i. We really feel like this is Our Little Slice of Heaven!! 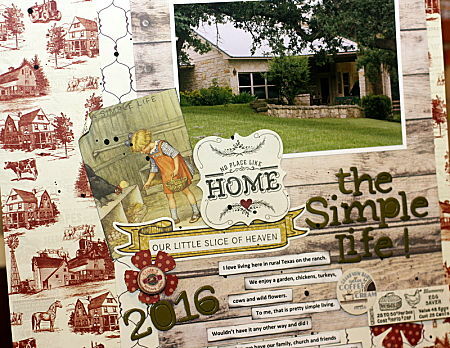 Gorgeous page and home!! Always loved Authentique. Ohhhhhhhhh this is gorgeous! LOVING that vintage feel!!!!!!!!!!!!! I am glad you struggled because this is will be one of my favorites of all time. Awesome job! Great page and beautiful place to live. I like the slice of heaven embellishment.